On Sunday morning (28th December 2014), Marija and I had intended on activating Mount Remarkable, VK5/ NE-010. But to be honest, we were quite exhausted from the 10 km walk the day earlier, when we had activated The Battery, VK5/ NE-055. So we chose an easier option. We were heading south back home, which would take us passed Illawarra Hill, Bumbunga Hill and South Hummocks. I tried calling the owner of the land that Illawarra Hill is located on, but could not get through. So I tried the land owner for the next summit south, Bumbunga Hill. John agreed there was no problem. So after packing our gear, that is where Marija and I headed…..Bumbunga Hill, VK5/ SE-015. 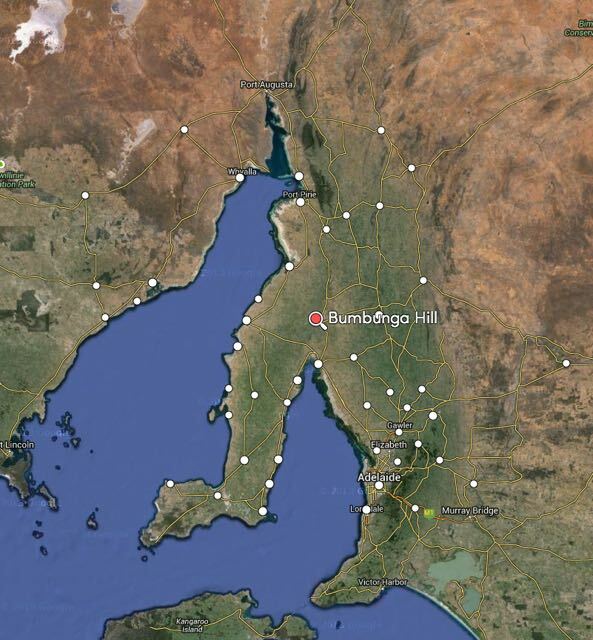 Bumbunga Hill is located near the town of Lochiel, in the Mid North of South Australia, about 130 km north of Adelaide, on the Augusta Highway. 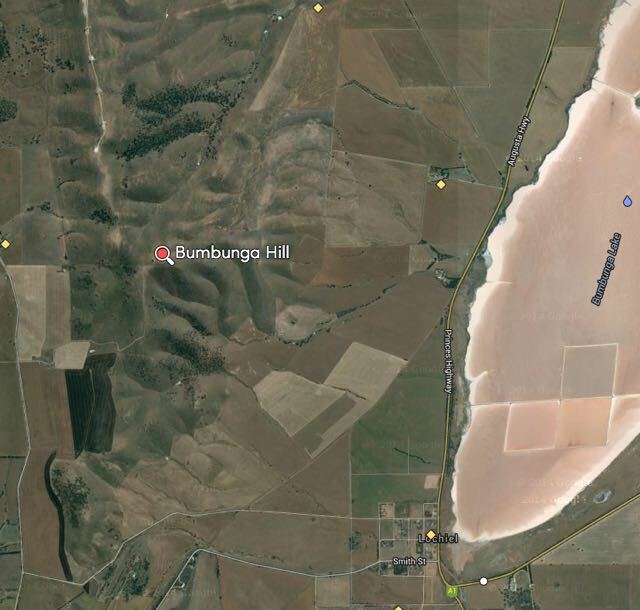 Bumbunga Hill is 413 metres ASL and is worth 1 SOTA point. The summit is located on private property, so PLEASE obtain permission before entering onto the summit. Details of the owner can be located on http://www.sota.org.uk. Access is via Landslide Road, which runs off Smith Street. Smith Street is located on the western side of the Augusta Highway. I can never miss that street because on the corner is a business sharing my sirname…. The land owner, John was kind enough to unlock the main gate for us. At this entrance point you will see a shed and an old house ruin set back in the paddock. If you see them, you are at the right gate. However, access is not possible unless you contact John first. In any event, the gate is normally locked. We continued along the dirt track leading to the summit, passing throug a few more gates in the paddocks. The track becomes progressively more rocky and rough, with lots of washaways. I would not attempt this is in a conventional vehicle, but it is easily passable in a 4WD. Once we got close to the summit, we parked the car and walked the remainder of the way. I last activated this summit in April, 2013. More information on that activation can be found at….. I noted this time that the old trig point had been removed. All that is now left of where it once stood, are three blue painted upright poles. Just ideal to attach the squid pole to, with the assistance of some octopus straps. And for this activation I had a few of the creature comforts, including a fold up chair, courtesy of Marija. I managed to set up by 2353 UTC (10.23 a.m.) with only a few minutes to spare before the UTC ollover. In that short window, I managed to work 13 stations in VK1, VK3, & VK5. 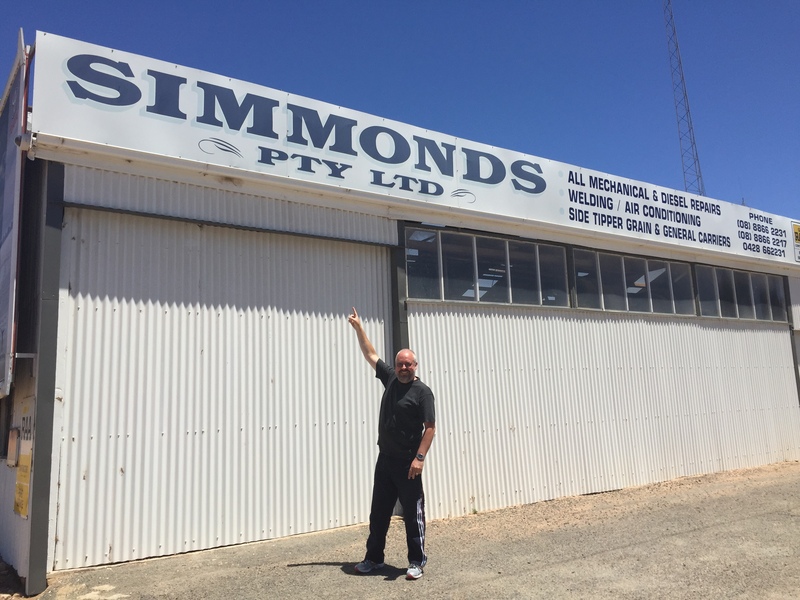 The first four contacts were with Larry VK5LY in The Riverland, Nev VK5WG in the Mid North, Matt VK1MA/3, and Col VK5HCF in Mount Gambier. I was also called by Andrew VK1NAM who was portable on Mount Stromlo, VK1/ AC-043. I was very pleased, my first summit to summit contact for the weekend. My final contact before the UTC rollover was Tom VK5FTRG who was portable in the Canunda National Park, in the South East of South Australia. This park qualifies for the World Wide Flora Fauna (WWFF) program and the VK5 Parks Award. 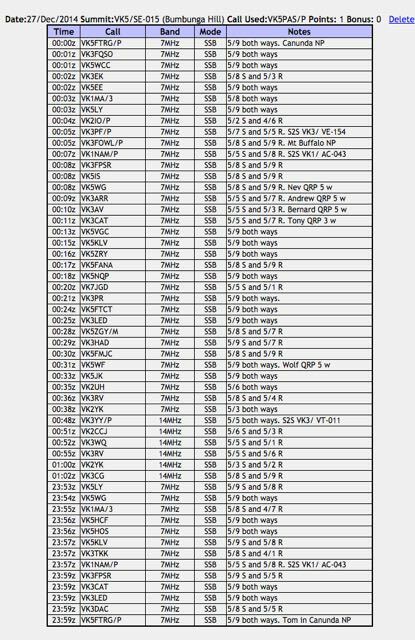 After the UTC rollover I worked a further 34 stations on 40m ssb in VK1, VK2, VK3, VK5, & VK7. This included a few more summit to summit contacts, including Peter VK3PF portable on VK3/ VE-154; and Andrew VK1NAM on Mt Stromlo VK1/ AC-043. I was also fortunate enough to work Julie VK3FOWL portable in the Mount Buffalo National Park, which qualifies for the Keith Roget Memorial National Parks Award (KRMNPA) and the World Wide Flora Fauna program (WWFF). I then slipped up to 20m and worked a further 6 stations in VK2 and VK3. Conditions on 20m were not great, with lots of QSB present. But I did manage to sneak in another summit to summit. This time with Glenn VK3YY who was portable on SOTA peak Mount Tamboritha, VK3/ VT-011, which is also located in the Alpine National Park. So another KRMNPA and WWFF contact as well. So after a little over an hour on the top of the hill, I had a total of 53 contacts in the log. It was getting hot, Marija was getting a little impatient (had read all her magazines), and I was getting hungry. So it was off to Port Wakefield for some lunch at the bakery. Although Bumbunga Hill is only worth 1 point, the views from the top are spectacular. It has great take off in all directions. And access is easy. All in all a great summit. And again thanks to John, the land owner, who kindly allowed us access. We touched base with him again as we left the property, and he was very pleased we enjoyed the trip to the top. This entry was posted in SOTA summits. Bookmark the permalink.